Collect radiation counts in either analog or digital formats. 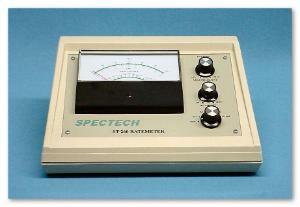 This unit brings new concepts to the basic Ratemeter for nuclear radiation measurements. Light weight, rugged construction coupled with internal rechargeable batteries allows up to 8-hours of portable operation for surveying, instruction and training. Continuous bench top operation is accommodated with the AC charger supplied. Fully variable high voltage and advanced design will support many different types of Geiger Mueller probes with operating voltage up to 1200 volts and count-rates up to 150,000 events per minute. Featuring a large precision analog meter, offers dual scales for direct reading in both counts per minute and counts per second for international markets. To aid in classroom demonstration of basic radiation properties, an interface to the IBM compatible PC is included together with emulation software. 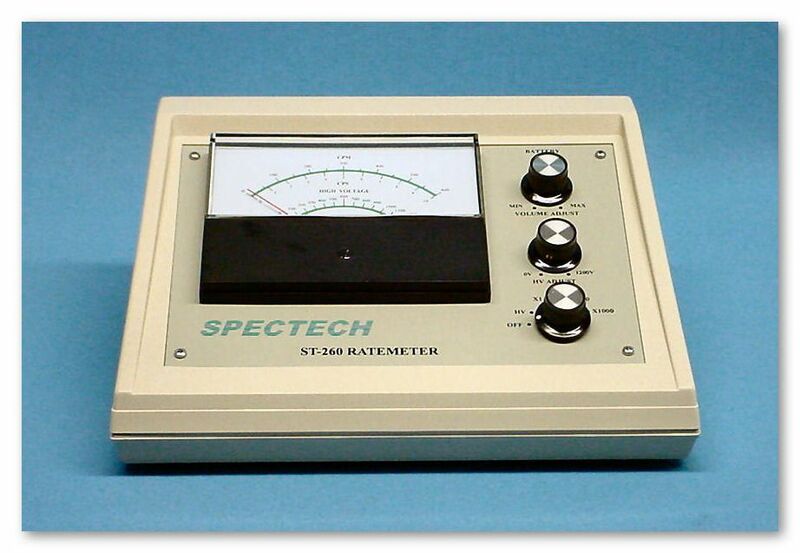 This allows data from the ratemeter to be collected in the computer and displayed on the screen in either analog or digital format. Data is stored in files which may be transferred directly to many common spreadsheet programs. This advanced feature allows access to spreadsheet functions such as mathematical calculations and graphical output of data. Input; BNC connector. Accepts standard Geiger probes. High voltage; 0 to +1200volts, continuously variable. Display; Precision 4.5" meter. Ranges; CPM--- 600, 1500, 6000, 1500, 60000, 150000. CPS--- 10, 25, 100, 250, 1000, 2500. HIGH VOLTAGE---0 to 1200 volts. Audio; Piezo alerted with full volume control. Data Link ; Standard USB. Power; Internal rechargeable NiCad batteries, with LOW POWER indicator. Typically 8-hours run time on full charge. Input 9 volt DC, at 300mA from AC line charger. Specify 110-120, or 220-240 VAC charger at time of order. Dimensions; 12 in. W x 8 in. H x 4.5 in. D.